I don’t believe people can identify this plant from this picture, but just in case someone wants to take a shot at it, I won’t reveal the answer until below the fold. This is a very small specimen of Ananas comosus. Otherwise known as the pineapple. One of my favorite non-grass plant species. As summarized in Why Pineapples are Awesome. If this plant ever bears fruit, it will likely take at least two years, longer than I’ve yet successfully kept a plant alive, and will call for several re-pottings. 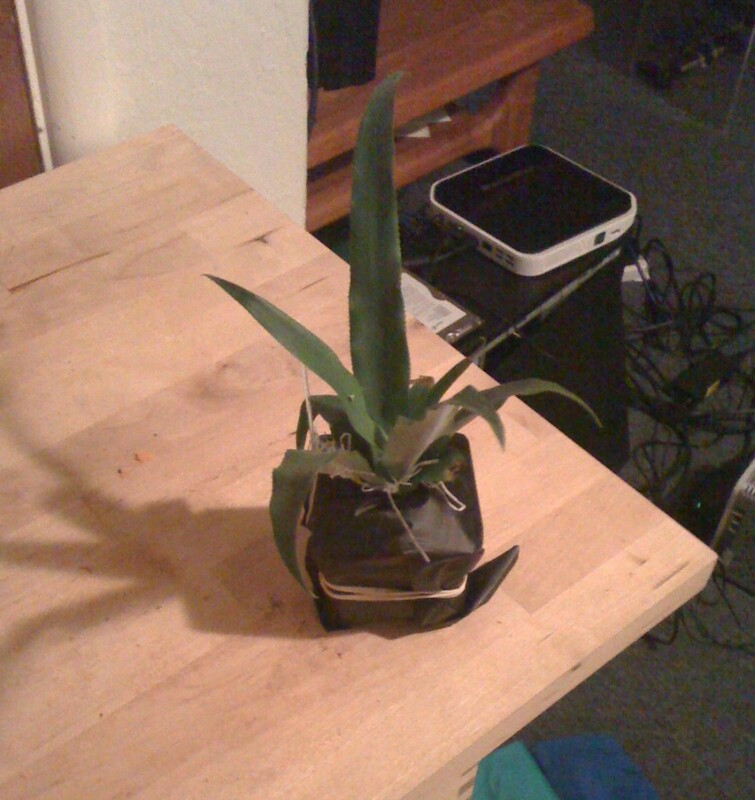 But baring the unexpected (like getting kicked out of grad school) I’m going to be living in the area for several more years and it’ll be good to have long term things to look forward to (if I don’t kill it, the plant should produce a pineapple fruit well before I produce a PhD). I don’t have anything more to share on the subject. I’m just excited and needed to share it with the world. 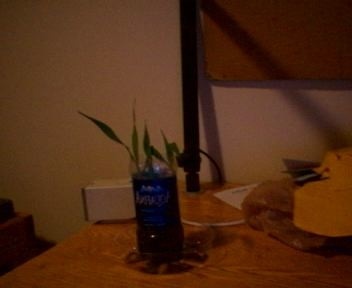 First "houseplant". Corn. Plastic water bottle. Freshman dorm room. This photo was taken in the middle of the semester I was becoming disillusioned with economics, and less than three months before I got the job (in a maize genetics lab) that set me on the very different career path I am currently engaged in pursuing. Uh-oh. This is how it starts. Cool, tropical fruit! That’s one of my two favorite things in the plant world, the other being hardy fruit. At first I thought it was an agave; do you know what variety it is? I’ve got a bunch of fruit plants living inside with me. Weird ones, I guess. Rose apple, pink wampee, pacay, Uganda powder flask, nam-nam, mabolo, yellow tamarillo, naranjilla, prickly pear, lychee, whortleberry cactus, and Chilean guava (aka uñi, ugni, murtilla). I used to have a cabelluda, an araça-boi, and a guajilote, but the guajilote died of an infestation, and the other two died when I got caught up in a bunch of tests and forgot to water things on the back of my growing mess where they were. Sad days. I also once has some seedling pitaya that just kind of shriveled up and died after a year or so. I’ve got some Brooklyn Dark fig cuttings sitting around too, hoping they root so I can put them outside in the ground this spring. Tropical fruit can really grow on you. My interest in them is what led me to thinking about plant breeding, then to plant genetics and genetic engineering, then to where I am now, looking to get more out of life than where a finance degree leads. If you like pineapple and care to join in on the obsession, maybe you can expand with some superficially sort of similar screw pine seeds. Wow! That’s a very impressive list man. I only visually a couple of those fruits. I couldn’t resist googling Uganda Powder Flask and the first hit says the fruit is presumed to be edible but information is scarce one way or the other. I’ve curious what you think of your lychee plant (and do you ever get it to flower? ), as I’d definitely put that into the same category of awesome exotic fruit as the pineapple. I read a PATSP post on screw pines, and it sounds like they get HUGE, which would be awesome as long as I’m able to moving into bigger apartments faster than the plant grows. My new pineapple is a “smooth cayenne”, which I guess is a pretty common pineapple breed. Thanks. I do what I can. I have very little room, and would love to add so much more because there are so many out there, but unfortunately, I don’t have the space or money to go hog wild on it right now, especially since buying tropical seeds on the internet is really hit or miss in terms of ‘is this going to germinate’, and I’ve had a heck of a lot more misses than hits. The Uganda Powder Flask is a cool one, it’s the one I most want to try. It probably won’t be that great, but it sounds so neat. I hope it makes it to maturity; it’s a real slow grower and it has always been pretty weak. New growth has a tendency to die fairly often, but it is slowly getting larger. My lychees are too young to flower. They are just seed grown ones that I started for the heck of it since I had the seeds, they’re not like a grafted Brewster or anything (alas), and while they’re sturdy at the bottom, they haven’t grown much for a while. A while back my cat made a salad out of them too; that didn’t help any. I don’t think they (or anything else probably) will come to flower without a nice warm greenhouse, which I don’t have right now, but I figure since the best time to plant a tree was ten years ago and the second best time is now, with any luck I’ll have some mature specimens by the time I can finally provide the right environmental factors to get fruit. Lychees are a great fruit, of the few less common ones I’m managed to find they’re my favorite. I’d love to, someday, study the hardiness of plants and develop a lychee that can be more widely grown in the US. Heh, I’d like to do it with genetic engineering (which is probably about the only it can be done, at least without a million years of evolution or an X-Men level mutation) and see how that fits into the whole ‘GMOs are all about monoculture and reducing diversity’ argument. I’d be curious to see what effect the gene from the infamous ‘flounder-tomato’ would have if inserted into other plants. Musa basjoo, I think there were some on the local Penn State branch campus in the summer, but I don’t know if they’re replanted every year of if they actually survive. I wonder if that species could yield any insights to maybe developing hardy strains of fruiting bananas (or ensetes). I like hardy plants too, and ones that seem tropical like that are particularly neat. Poncirus trifoliata, Opuntia humifusa, and Passiflora incarnata are three other seemingly out of place hardy plants that come to mind, and in the case of the former I think it would be interesting to do molecular breeding work to develop a citrange hybrid worth eating. Maypop, that’d be another great crossbreeding project I think. I bought a really small one once, but never came back up in the spring, I’ll have to try again with a bigger one sometime. I’m giving Opuntia humifusa a shot here in central Pa, since my big indoor one probably won’t flower for me I’m hoping to have some of the tiny prickly pears next year. When the snow briefly melted here a week ago they hadn’t turned to mush, so that’s a good sign. Lots of cool and kinda out there stuff I’d like to see in the pomological world I guess 🙂 I like a lot of diversity in my produce. There’s most recent good review I could find on anti-freeze proteins in plants is this one from back in 2004. Depending on how controversial you felt like being you could using anti-freeze proteins originating in sources as diverse as arctic flounders, fire colored beetles or winter rye to try to product more cold tolerant versions of tropical fruits. Before looking into it just now I didn’t realize many of the anti-freeze proteins in plants apparently evolved from genes that originally functioned as defenses against fungal attacks, and depending on the species you’re looking for them in, anti-freeze proteins will have originated from different sources. Which makes sense now that I think about it, since many plants living in colder climates today probably evolved from species in the tropics that didn’t need cold protection genes, and would have had to evolve such protection independently (and many species that now live in the tropics can probably trace their ancestry to cold hardy species living in the temperate zones, but lost their cold protection genes when they were no longer needed). If you’re interested, here’s the original flounder-gene-in-a-plant (tomatoes and tobacco) paper that started the meme of fish-tomatos and fish-strawberries that you can still spot at the occasional protests. It came out almost twenty years ago. I like the idea of picking plants to start now based on the facilities for growing them one hopes to have a decade down the line. Always hear gardeners talking about thinking on that time scale, but I don’t hear it much when talking about plants growing in containers (or maybe I just haven’t been talking to enough plant lovers lately). Plus its motivation to work towards a future where I can afford my own greenhouse, which I’ve wanted since the first time I set foot in one during the middle of a New York winter. Oh, I almost forgot. I don’t think you were reading when I originally posted this. If you scroll down to the bottom of the entry there’s a picture of a hardy banana (Musa basjoo) growing at my folks place in central Iowa. Of course at that point it hadn’t actually survived an Iowa winter. I can’t wait to hear if it grows back this spring!